Once you have identified your affiliate link, one of the next steps is to add an affiliate banner to your website. Banner ads can be found on your iDevAffiliate dashboard under “Marketing Materials”. You can filter ads by clicking the drop-down menu “Marketing Groups”. 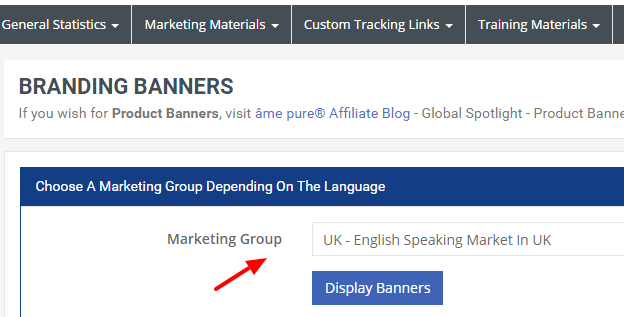 Each speaking language (market) represented on www.amepure.com has its own Marketing Group – choose the language group of the audience you want to reach! Once you find a banner you would like to upload to your website, simply copy the HTML coding to add to your website. © 2017 âme pure®, Ltd. All Rights Reserved.